A couple of weeks ago on our new Facebook page I posted the above image of Park Jong Il. That post received more than 700 hits, more than three time the number of hits on its nearest competetor and more than five times the average. As you can see we're not a well known Facebook page yet but for us that is impressive. However, I'm sure those who saw and shared it shared it for many reasons. But they should have been sharing it for just one. Park Jong Il is one of just a very few remaining teaware artists that understands the heart and soul of Korean tea and teaware. 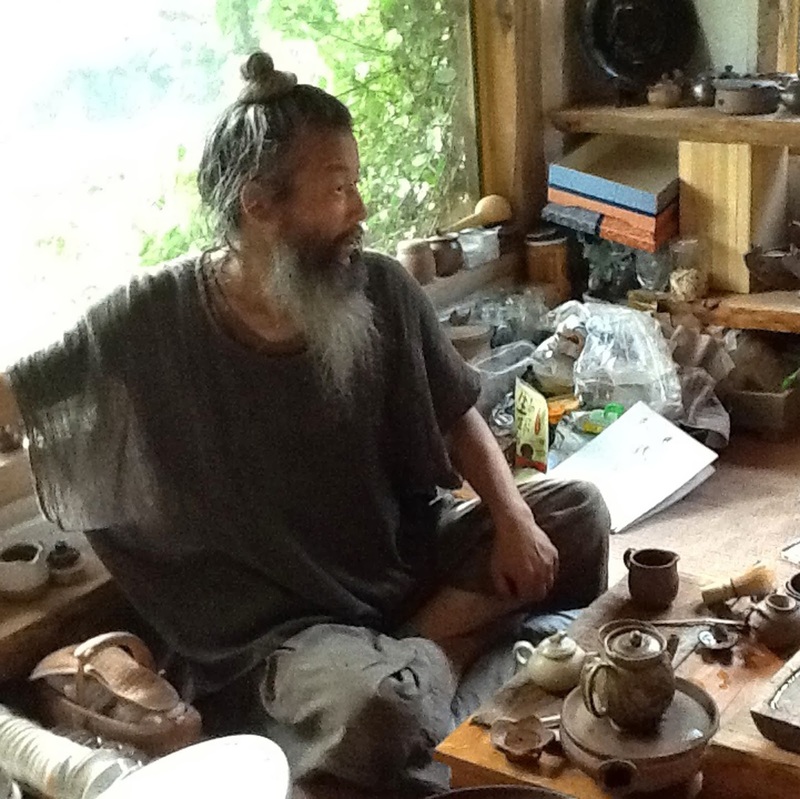 He is one of a rare few who have been able to tap into the true spirit of the teaware masters of old whose work are so highly revered today - especially in his teapots. Sure on occasion he adds a whimsical knob or will even play with form but underlying all of that is a 'jangin' master. He is naturally full of the spirit of clay of Tea and teaware. Those who know Korean art deeply know there is one overriding eternal basic philosophical and aesthetic position - the work must be natural. I think there are hardly any pots in the world through which a people’s life breathes more directly as Korean ones, especially Yi Dynasty(2) wares. Between pots and life, Japanese ones have “taste”, Toft wares have “enjoyment”, even the Sung pots have “beauty”, and so on. But the Yi dynasty pots have nothing in between; peoples’ lives are directly behind the pots. As you review this blog and are introduced to Park Jong Il's work and family you will soon realize that Park Jong Il's life breathes directly through his work. If you are interested in a teacup, teapot, chawan or simply want to taste one of his favorite teas, contact us. 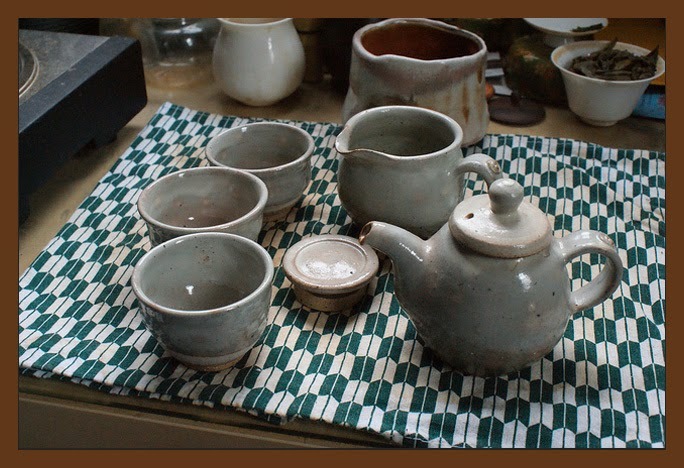 (1) This particular teaset by Park Jong Il is one of his newer but simpler styles. (2) The term Yi dynasty was often used by the Japanese in reference to the Choson or Joseon dynasty. The Yi family ruled Korea throughout the length of the dynasty. Hello Arthur. The new Park Jong Il page looks great. I always love seeing new work by the artist. The teaboat above is very unusual. The shape is like the canoes we use here in the states. Is this an actual representation of a boat? Hi Dawson, Thanks for finding and connecting to this new blog. I haven't even announced it yet but people seem to find it. The boat has Taoist significance. It is one of his alternative ways of handling water. But you are not really seeing new work here. I re-posted some older posts on him into this new blog. But you will be seeing new work here and will be very surprised at some of the directions he is taking. I created this new blog on him and his family in English because he deserves it. It will look at the family along with him hopefully bringing him as an artist closer to those who purchase his work. That type of opportunity doesn't happen much. He will remain my main artist but I'll be introducing new teaware artists whose works are more diverse and cover a broader taste span. Watch for them to appear first on my blog morningcraneteaware.blogspot.com.